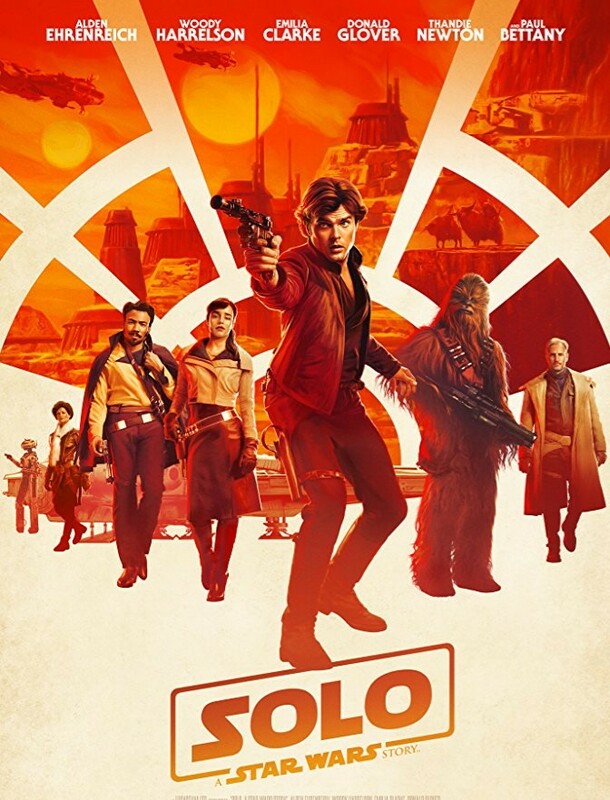 Solo A Star Wars Story (2018) touches on much of the past mystique that is Han Solo, while delivering a quick, action-packed ride of a film. "During an adventure into the criminal underworld, Han Solo meets his future copilot Chewbacca and encounters Lando Calrissian years before joining the Rebellion." Solo stars Alden Ehrenreich as Han Solo, Joonas Suotamo - Chewbacca, Woody Harrelson, Emilia Clarke, Donald Glover as Lando Calrissian, Thandie Newton, Phoebe Waller-Bridge as the voice of L3, Paul Bettany, Jon Favreau voicing Rio Durant, Erin Kellyman and Linda Hunt voicing Lady Proxima. The film starts out at a fast pace and almost never lets up, as we learn about Solo's first real love, how he ended up meeting Chewbaca, how he got into the world of smuggling, met Calrissian and other details. Details that we've seen referred to over the years. Oh, and we got to see the Millenium Falcon in all its off the showroom, shiny new glory. Don't be confused when you first see it. And you may know what I mean. The film also deals with the evolution of the Falcon through the film. Ehrenreich did his homework and delivered a great young Han Solo, while Glover (Not related to Danny Glover) made a wonderful Calrissian. The surprise breakout characters for me was Enfys Nest and the droid, L3, was just a hoot to encounter and watch. Overall, the IMDb score of 7.1 is a good reflection of the fun of the film while Rotten Tomatoes score of 71% is surprisingly matching up with the IMDb users. The film was a great, nearly non-stop action ride as we followed Solo through his adventures. Sure, they seem to unrealistically hit on all his historical marks, but who cares, right? This was a Star Wars popcorn film, period. Many critics had issues with the film to some degree, but they always do with popcorn fun films. If you're on the bubble if you want to see Solo or not, I'd suggest go. It's a fun adventure peppered with Star Wars lore.